Account: An account is a access authorisation to the CKAlender system. Here, a differentiation between three different account types is made: administrator account, user account and guest account. With the account the access rights are individually defined. To create and edit accounts, administration rights are necessary! CCalendar knows three different account types for every registered organisation: administrator account, user account and guest account. The administrator account has unrestricted allrights within their organisation. So the administrator is able to create and delete new appointment group, new user and guest accounts, assign individual rights (especially reading and writing rights) and make miscellaneous organisationwide configuration settings, which remain unavailable to normal users and guests. Every organisation needs to have at least one administration account for management. (Will be created automatically upon initial registration of an organisation!) When an administrator logs in with their login details, they automatically, additionally to the user menu, get the administrator menu displayed in their CCalendar view with which they can do the management tasks. Bookable Resource: A "bookable resource" is a special type of appointment group, which is flagged as bookable resource. Bookable resources can be reserved with a reservation request by external users without CCalendar account. You can find more detailed info in the instructions to the booking system. Booking module / Booking systen: see instrucions "Booking Module"
Login: To log in as user, administrator or guest on the CCalendar system of a registered organisation. You can find the login under the menu item um Login "to Calendar". You can find more detailed info to the login on the manual page "Login". Guest / Guest Account / Guest Righs: CCalendar knows three different account types for every registered organisation: administrator account, user account and guest account. A guest account in CCalendar only owns restricted rights. With the login details of a guest account a user can log in on CCalendar - but there can only view all public, fixed appointments with the status "to all". They cannot view other appointments and edit or delete appointments. Also, a guest cannot setup a mail subscription. Yet, a guest receives e-mail sent "to all" with the Directmail- function. Client: Within CCalendar a user of the optional booking system is named client. A client can book bookable resources within CCalendar, without having a normal CCalendar account. That means you do not have to assign user rights to a client in CCalendar. There is a seperate login page for clients, which is clearly distinguished from the login page for normal users. You can find further info in the instruction to the booking system. Mail Subscription: As CCalendar user you can subscribe to all appointments for which you own reading rights per e-mail. You can choose between daily, weekly and monthly distribution of the appointments relevant to you. (Multiple selection is also possible!) Moreover, you can accept immediate mail notifications if someone creates, edits or deletes an appointment relevant to you. You get to your individual subscription settings under the menu item "Settings/Mail Subscription" when logged into the CCalendar system. You can find more detailed info to the mail subscription in the instruction in "Edit participant settings (Mail Subscription)". Participant / User: A participant is a user within the CCalendar organisation account. Here, CCalendar differentiates between three types of participants: administrator account, user account and guest account. 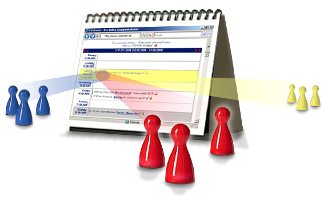 Appointment Groups: An appointment group in CCalendar is an amount of users that contain certain appointments. Instead of "appointment group" you could also say "recipient group". In CCalendar you can define the appointment groups within your organisation on your own and arbitrarily assign users to appointment groups. Of course an arbitrary amount of multiple assignments is possible. The assignment of users to appointment groups in CCalendar is done with "reading rights". When a user has reading rights for a certain appointment group, you can say: "The user X is assigned to the appointment group Y." You can find further info to appointment groups and the assignment of users to appointment groups in the instructions to "Assigning participants to appointment groups"
Organisation / Organisation Account: Superiour account within CCalendar, which contains all settings and users of an organisation. To use CCalendar, every organisation (Club / Company / Community / etc.) only needs one organisation account which is managed by the CCalendar administrator. An organisation account usually contains at least one administrator account and several user accounts or guest accounts. Charges always apply only once for the organisation account - independently of how many admin, user and guest accounts are created. You can find further info to the registration of organisation accounts in the instructions to "Initial Registration"
User / User Account / Normal User Rights: CCalendar knows three different types of accounts for every registered organisation: administrator account, user account and guest account. The user account is the normal account for CCalendar users. With the user account a user can log in CCalendar and view all appointments, for whose appointment groups they own the necessary reading rights. Furthermore they can edit all appointments for whose appointment groups they own the necessary writing rights. Moreover, they can setup an immediate, daily, weekly or monthly mail subscription after their desires for all appointment groups, they at least own the necessary reading rights for. The assignment of reading and writing rights can only be done respectively by the administrator of an organisation. Appointment Series (Master): Under this is to be understood the master entry of a, in a certain interval, recurring appointment. (This entry is existing exactly once for every appointment series. An appointment series can contain an arbitrary amount of series exceptions and / or series variants. You can find further info in the instructions to Editing Appointment Series. Series Variant: In case the content of a certain day within an appointment series is modified, a copy of the appointment master is created, containing the deviation (=series variant) for the one, certain day. Series Exception: In case a certain day within the series interval is suspended, this is called series exception. Thus a series exception is a certain type of series variant within a series interval - namely with no entry. "You have a super product; I use it a dozen times daily."